Choosing tires is not an easy thing, because you need to be careful. Ban strongly associated with comfort and your security in the drive, then you can not indiscriminate in choosing tires. You not only need a sharp, you also need to understand the code that is listed to be able to figure out the tire that’s right for your vehicle. Often people are confused to vote because of a lack of knowledge about the ban. However, this time we will discuss 2 tire product often used in his Jeep. Cooper Discoverer AT3 vs. BFG All Terrain that is at once will be the title of this article. Cooper Discoverer AT3 is fulfilled with balanced combination of technology, it compounds and designs to produce a tire will well performance in nearly all types of terrains. 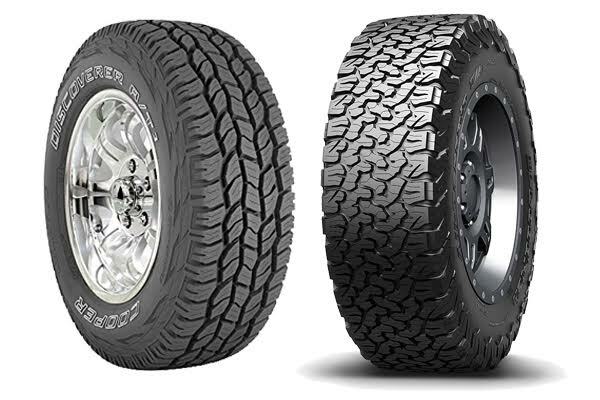 The tread compound enhances wet traction and rolling resistance, while the aggressive tread design significantly improves off-road traction without sacrificing highway performance and provide an outstanding performance in both on-road and off-road driving applications. The thread compound is formulated with a chemically coupled silica carbon black mixture that provides excellent wet traction and handling on the highway and the Dual Draft Tread element Walls aid in reducing stone retention and stone drilling and assist in cut or chip resistance. And last, the Lateral Groove Protectors can reduce the chance of stone retention and drilling. BFGoodrich or often mentioned as all-new All-Terrain KO2. This is an on or off road especially developed for jeep, pickup truck and sport utility vehicle drivers who want confidence and control on and off road and also it is designed to deliver go-anywhere traction along with outstanding durability, great wear and year-round traction, even in snow. The features are consisting of a racing derived cut, chip & tear resistant tread compound that delivers longer life. An aggressive and computer optimized compound, upper shoulder sidewall Armor, and a Serrated Shoulder Design. The compound is also a high-void all terrain pattern with interlocking tread blocks, innovative siping and multiple loose object ejection features to combine off-road durability and traction with on-road handling and acceptable noise. And the Serrated Shoulder Design that delivers additional traction by providing the clawing action necessary to develop traction and steering control in deep dirt, sand or on rock during “aired down” off-road driving. BFG All Terrain is an excellent tire for dry climates and do particularly well on gravel or dirt roads and well built also. However they’re only moderate on wet surfaces, and after about half the tread life is gone could fairly be described as poor in the wet. In addition due to the strongly angled tread (away from running square / parallel to the spinning direction) they load of with mud very fast and don’t shed it worth a darn. While the Cooper is special made for those who want to be served by it in all conditions with billion miles.